The Parliamentary and provincial elections scheduled for November 26 and December 7, 2017 could boost domestic demand through increased consumption expenditure which in turn could improve consumer and investors’ sentiment generating positive impact on growth. Estimates of Central Bureau of Statistics (CBS) show the growth in the real GDP (at producers’ price) at 7.5 percent in 2016/17. Similarly, the real GDP is estimated to grow at 4.7 percent in 2018 (Asian Development Bank). As shown in table below, the weighted average inter-bank transaction rate among commercial banks, which was 2.56 percent a year ago, decreased to 0.39 percent in the month of September. Similarly, the average base rate of commercial banks increased to 10.13 percent from 6.23 percent a year ago. The base rate was 9.67% in August. As per the data published by NRB, it has not disclosed weighted average deposit and lending rate since mid-August. The weighted average 91-day Treasury Bill rate decreased to 0.48 percent in the second month of 2017/18 from 2.05 percent a year ago. The annual average consumer price inflation moderated to 4.5 percent in 2016/17 from 9.9 percent in the previous year. The inflation has risen to 3.4 % in mid-September 2017 from 2.3% in mid-August. The Deposits of banks and financial institutions (BFIs) increased 2.4 percent in in the month of September. As shown in table above, the Deposit in FY 2017 July was NPR 2,375 billion and this was increased to NPR 2424 billion in FY 2017 September. The total loan disbursed by BFIs till FY 2017 September was NPR 2,024 billion and Total loan till FY 2017 July was NPR 1,986 billion. The increase of 1.91%in loan disbursement was observed during first two month of fiscal year. In the review period, private sector credit from commercial banks, development banks and finance companies increased 1.8 percent, 4.8 percent and 1.3 percent respectively. On y-o-y basis, credit to the private sector from BFIs increased 16.6 percent in mid-September 2017.
Credit to the agriculture sector increased 2.1 percent, industrial production sector 2.4 percent, construction sector 3.0 percent, wholesale and retail trade sector 3.3 percent, service sector industries 2.8 percent and transport, communication and public sector 2.8 percent in the review period. Of the total outstanding credit of BFIs, 60.9 percent is against the collateral of land and building and 14.2 percent against the collateral of current assets (such as agricultural and non-agricultural products). Such ratios were 60.6 percent and 15.2 percent respectively in the corresponding period of the previous year. NRB mopped up Rs. 104.90 billion through open market operations in two months of the fiscal year 2017/18, . Of which, Rs. 35.15 billion under deposit collection auction and Rs.69.75 billion through reverse repo auction on a cumulative basis. 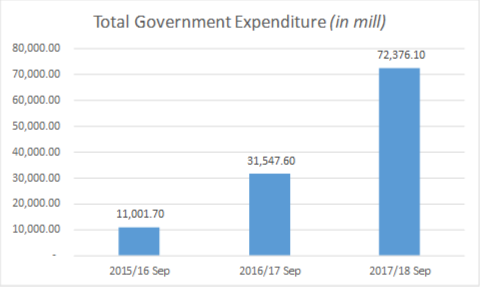 The total government expenditure on a cash basis was NPR 72.38 billion. Such expenditure was just NPR. 31.55 billion in the corresponding period of the previous year.